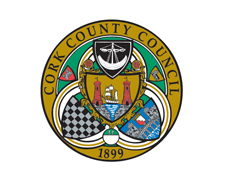 If you are new to Cork Week have a read of these FAQ’s – this section will put our new visitors at ease about Cork Week. Please contact the regatta office if you require any further assistance and we will steer you in the right direction. When is the next Volvo Cork Week? Volvo Cork Week 2018 will be held from 16th July to 21st July, 2018. 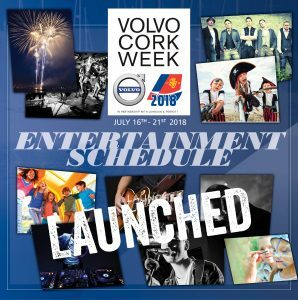 What is Volvo Cork Week? Volvo Cork Week is, alongside Dun Laoghaire Week, Ireland’s biggest sailing event. It’s inception in 1978 was the beginning of over three decades of great sailing and fun ashore in the wonderful waters of Cork Harbour and its surrounds. The successful format includes amazing competitive racing, which is held on 6 different courses and an incredible social scene to cater for all tastes. 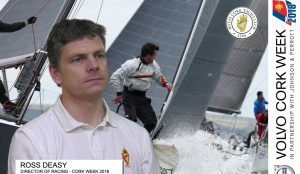 The Race Courses include the Harbour Race which is sailed around Cork Harbour and this is certainly a highlight of the week, all other courses are sailed outside the mouth of Cork Harbour and the scenery is spectacular. The Windward/Leeward Course has its own race area, as does the One-Design Course, Olympic, Slalom & Trapezoid Courses. Ashore at night there is a party like atmosphere in the tented village with numerous live bands playing Rock, Irish & Disco Sounds. From the early days of 60 boats to just over 600 in the late nineties the Regatta currently runs at approx. 150 boats which makes for highly competitive sailing in an un-crowded atmosphere. 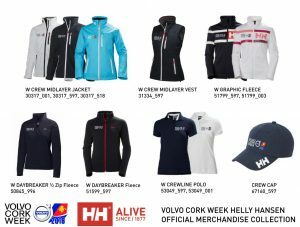 Who organises Volvo Cork Week? The Organizing Authority is the Royal Cork Yacht Club which is the oldest yacht club in the world founded in 1720. 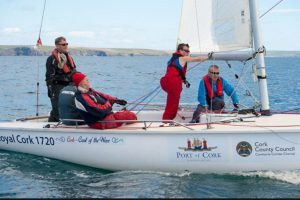 The club is in it’s current situation in Crosshaven since 1966 and is in the forefront of all branches of sailing activity. It’s members have competed in most of the world’s leading competitions including America’s Cup, Whitbread & Volvo Round the World Yacht Race, Solo Circumnavigation, Admiral’s Cup, Commodores Cup and Olympic Games. The Notice of Race is now available. Watch out for our adverts in mainstream sailing magazines and Online Publications. There is a unique variety of racing available for each fleet. Every day presents a different course for the fleets with the exception of the One Design Sportsboat Classes who have a separate One Design course designated to them. The Race Courses include the Harbour Race which is sailed around Cork Harbour for some this is the highlight of the week, all other courses are sailed outside the mouth of Cork Harbour and the scenery is spectacular, the Windward/Leeward Course has its own race area, as does the One-Design Course, Olympic, Slalom & Trapezoid Courses. All above will be illustrated in the Sailing Instructions available closer to the event. How do I get to Crosshaven? Crosshaven is situated in the Lower Harbour Area and is only 12 miles from Cork City. Cork Airport – an International Airport, which has all the services that one, would expect in a major centre of population – is only a 15/20 minute car journey away. The airlines that serve Cork Airport are Aer Lingus, Aer Arann, Air Southwest, BMI Baby, Jet2.com, Ryanair and Wizz Air. The nearest port to Crosshaven is Ringaskiddy and is served by Brittany Ferries and Cork-Swansea Ferries. Irish Ferries travel from Fishguard to Rosslare, Cherbourg to Rosslare and Holyhead to Dublin. Ferries also operate from Scotland to Belfast and the Isle of Man to Dublin. Please check with a travel agent as Isle of Man Ferries operate on a seasonal basis. All the major car rental companies are available in Cork Airport or in the city centre. Iarnród Éireann (Irish Rail) have trains connecting Cork with all major towns and cities along with Bus Eireann who have a frequent timetable network. How can I find accommodation for the regatta? In the Accommodation section of this website there are contact details for visitors who wish to book the different types of accommodation available. Obviously, as is always the case, if you book early there is more accommodation to choose from. What if I am not racing? 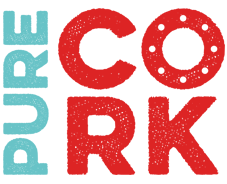 The tented village is home to a number of clothing leisure wear retail outlets – some who travel from overseas to retail at the event and well worth viewing. The coffee bar on site is very busy especially in the early morning before the boats leave for the race courses. This procession is carnival like and can be viewed from Currabinny (on the opposite side from Crosshaven) or along both Point Road and Camden Road in Crosshaven. Fota Wildlife Park houses many species of animals that roam together in 40 acres of grassland, much as they like in the African Savannah and not to forget Cork City Goal – a step back in time to see what 19th/20th century life was like in Cork behind prison walls. For details of other attractions please view the Discover Ireland website here. Nightly in the tented village, there is a vibrant and lively entertainment programme and which is a meeting spot for all crews. All tastes of music are catered for in the marquees dotted around the site with great live acts playing pop, folk, Irish, blues and the latest disco sounds. Where do all the boats berth? The Entry Fee includes a Shared Marina Berth or Shared Swinging Mooring. When you are entering there is an option to give your preference for either. Can I bring a mothership or RIB? Yes, of course. However you must enter your boat or RIB on the Volvo Cork Week Entry System/Form, this guarantees a Shared Marina Berth or Shared Swinging Mooring.